(1) Commentary of रामानुजाचार्य on this श्लोक starts with a very interesting opening statement इन्द्रियाणाम् आहारो विषयाः This of course has the context of the word निराहारस्य, which is sixth case singular of निराहार (either masculine or neuter, here masculine). (1-1) This word निराहार is from धातुः निर् + आ + हृ. (1-2-1) Since [हृ-घञ्] would be हरः, व्युत्पत्तिः of हारः should be [हृ-णिच् घञ्]. (1-2-2) हृ I 1 U. (हरति-ते, जहार, जहे, अहार्षीत्, अहृत, हरिष्यति-ते, हर्तुम्, हृत; pass. ह्रियते) 1 To take, carry, convey, lead, (often used with two accusatives in this sense); अजां ग्रामं हरति ŚK. ; संदेशं मे हर धनपतिक्रोधविश्लेषितस्य Me.7; Ms.4.74. (1-2-2-1) -Caus. (हारयति-ते) 1 To cause to take, carry or convey, send (something) by one, (with acc. or instr. ); मृत्यं मृत्येन वा भारं हारयति Sk. ; जीमूतेन स्वकुशलमयीं हारयिष्यन् प्रवृत्तिम् Me.4; Ms.8.114; Ku.2. 39. -2 To cause to be taken away, to lose, be deprived of. -3 To give away. -Desid. (जिहीर्षति-ते) To wish to take &c.
For such adjectival meaning, we need to treat निराहारः as a compound word with निर् and आहारः as the component words. The derived adjectival meaning then can be निर्गतः आहारः यस्मात् सः one, from whom all consumption has gone away. (2) The word देहिनः is grammatically both fifth case and sixth case singular (either masculine or neuter, here masculine) of the adjective देहिन्. (2-1) If we focus on विषयाः (= interests) विनिवर्तन्ते (= retire, go away, stay away) and ask the question “Go away or stay away from where ?”, then the answer should be ‘from the देहिन्’ hence देहिनः as fifth case singular becomes appropriate. (2-2) If we take अस्य निराहारस्य देहिनः विषयाः as one single phrase, to mean ‘interests of such bodily entity, which has undertaken fasting, has become निराहार, then the sixth case becomes appropriate. (2-3) The import may not be much different. But when writing word-by-word meaning, the paraphrasing will be different. (3) Interesting it is to note that instead of a person’s staying away from all interests, the interests themselves stay away ! The ‘interests’ do not find him interesting any more ! Point to deliberate becomes, whether this is an idiomatic statement or whether it can actually happen only like this. (4) रसः अपि निवर्तते is also a statement in the same vein. (5) But is not रसः an inherent part of विषयाः ? (5-1) But they have been mentioned in two different sentences, distinct from each other. So they need to be deliberated upon separately. (5-2-1) विष् I. 3 U. (वेवष्टि, वेविष्टे, विष्ट) 1 To surround. -2 To spread through, extend, pervade. -3 To embrace. -4 To accomplish, to effect, to perform. -5 To eat. -6 To go to, go against, encounter; (not generally used in classical literature). -II. 9 P. (विष्णाति) To separate, disjoin. -III. 1 P. (वेषति) To sprinkle, pour out. (5-3) रसः – Its meanings are derived from those of the धातु रस्, there again, its meanings in 10 U. 10 U. (रसयति-ते, रसित) 1 To taste, relish; रसती रसना रसान् Mb.12.285.19; मृद्वीका रसिता Bv.4.13; Śi. 1.27; Mv.7.3. -2 To feel, perceive. -3 To love. (5-4) From the above, it comes to mind that विषयाः are external instincts and रसः is internal. Even when a poet dwells on non-existent ideas, yet the poetry is charming, such poetry is full of काव्यरसः. (5-5) In the context of विषयाः विनिवर्तन्ते can we say that मेनका would not have been able to distract विश्वामित्रऋषि, if his intellect would have become so steadfast, that the result would have been only विषयाः विनिवर्तन्ते ? (6-2) In Apte’s dictionary वर्जः Leaving, abandoning. (6-2-1) वर्जनम् [वृज्-ल्युट्] 1 Leaving, giving up, abandoning. -2 Renouncing. -3 Exception, exclusion; P. I.4.88. (6-4) Considering that the अन्वयः is (एनं) परं रसवर्जं दृष्ट्वा रसः अपि निवर्तते, the विग्रहः as रसस्य वर्जः येन सः (one, who has resolved abandonment or casting off of रसः) suggests higher self-same intellectual strength than रसस्य वर्जः यस्मै सः (one, for whom it has to be abandonment or casting off of रसः). (7) Honestly speaking, I had somehow memorized this श्लोकः reciting as रसवर्ज्यम् in place of रसवर्जम्. Grammatically रसवर्ज्यम् is also a valid word. Pronunciations of रसवर्ज्यम् in place of रसवर्जम् is quite similar-sounding and does not affect the rhyme either. रसवर्ज्यम् also makes an interesting study. It is a compound word having रस and वर्ज्य as the component words. Such कृदन्त has passive voice inbuilt. In (एनं) परं रसवर्ज्यं दृष्ट्वा the word रसवर्ज्यम् is object of the verbal derivative दृष्ट्वा. Hence it is masculine second case singular of रसवर्ज्यः. Considering that वर्ज्यः has passive voice inbuilt, deciphering रसवर्ज्यः should be रसेण वर्ज्यः (तृतीया-तत्पुरुषः) to be shunned by रस. Since रस is discussed above as internal instinct, रसवर्ज्यः means one, who is to be shunned by रस, hence one, from whom all internal instincts also shun away. (8) It comes to mind that a देही, from whom विषयाः विनिवर्तन्ते and also रसः अपि निवर्तते, because he is रसवर्ज्यः, is like a sea, which is calm not only on the surface, but has no undercurrents also. A sea, which is calm on the surface could have undercurrents, maybe, due to movements of whales and other amphibians. Those amphibians are like रस-s ! They also shun such part of the sea, which is रसवर्ज्य. (9) The रसवर्ज्य state is further qualified by the word परम्. (9-1-1) Its etymology पॄ-भावे-अप्, कर्तरि अच्-वा provokes an interesting study. This etymology itself seems to get different meanings associated with the word पर. (9-1-2) धातु itself is पॄ 3, 9 P. (पिपर्ति, पृणाति, पपार, अपारीत्, परि-री-ष्यति, परि-री-तुम्, पूर्ण; pass. पूर्यते; caus. पूरयति-ते; desid. पिपरि- री-षति, पुपूर्षति) 1 To fill, fill up, complete. -2 To fulfil, gratify (as hopes &c.). -3 To fill with wind, blow (as a conch, flute &c.). -4 To satisfy, refresh, please; पितॄनपारात् Bk.1.2. -5 To rear, bring up, nourish, nurture, cherish. (10) The implied advice to अर्जुन is for him to become such a देही, from whom विषयाः विनिवर्तन्ते and also रसः अपि निवर्तते, because he is परं रसवर्ज्यः. And that advice to अर्जुन is eternal advice for the mankind, certainly for each one of us. Very, very challenging though !! (1) The word इव in the first clause denotes the use of simile as the figure of speech. In simile उपमालङ्कारः, there is one to one correspondence between two entities. I am using the phrase ‘two entities’, with the idea that there is one entity उपमान, with which another उपमेय is compared. When there is comparison between two entities, there are specific characteristics or attributes of the two entities, which are put in comparison with each other. The specific characteristics or attributes, which are being considered for comparison can then be called as उपमानसर्वस्वम् and उपमेयसर्वस्वम्. One can do well to tabulate these, so that one can see the one-to-one correspondence in complete detail. I have put a question mark for one item in उपमानसर्वस्वम् , because one needs to deliberate, what aspect of उपमानसर्वस्वम् compares well with इन्द्रियार्थेभ्यः in उपमेयसर्वस्वम्. 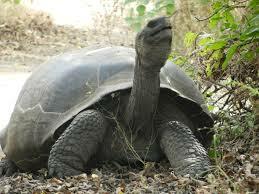 As can be seen in the picture below, a tortoise retracts its mouth from ‘what all is around it’. There are surroundings everywhere. One can never be without surroundings. The surroundings cannot be driven away. What one can best do is to withdraw oneself, internalize oneself, as a tortoise does. It is natural or inherent for the organs of sense to be enticed or distracted by the ‘surroundings’. Sweet scent or beautiful design on a butterfly or whispering woods or roar of a waterfall or soft touch of a child or sweet taste of honey are all characteristics of respective surroundings. शब्द, रूप, रस, गन्ध, स्पर्श are इन्द्रियार्थ-s of five sense-organs. One cannot put them away. But one can withdraw one’s involvement by internalizing oneself. 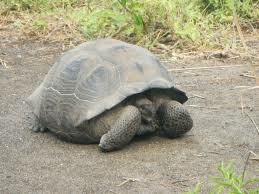 It comes to mind that there cannot be any simile other than that of a tortoise, where the concept is of retracting one’s organs. One may however ask, whether it is possible for humans to withdraw one’s organs, same way as is possible for the tortoise. The answer should be ‘yes’, not because it is said so in this श्लोक, but by realizing that humans are gifted with superior intelligence than the tortoise. So humans should apply their intelligence प्रज्ञा to do that, what a tortoise does by virtue of its special faculty. (2) There are 3 lines in गीता, which are repeated verbatim. The second line of this श्लोक is one such line. It is repeated in श्लोक 2-68. I would think that such lines, which are repeated verbatim are all that important, meaning that they have great import. Whereas every chapter of गीता has a title connoting one or another योग, where the word योग means ‘joining’. This line, specifying withdrawing the organs is actually speaking of वियोग i.e. separation. So to understand योग, one needs to not only understand but also exercise वियोग. (3) This line speaks of इन्द्रियाणि in general, not just ज्ञानेन्द्रियाणि. In (1) I mentioned शब्द, रूप, रस, गन्ध, स्पर्श just to explain इन्द्रियार्थ-s of ज्ञानेन्द्रिय-s. But कर्मेन्द्रियाणि also have इन्द्रियार्थ-s. To withdraw कर्मेन्द्रियाणि from their इन्द्रियार्थ-s is possibly best connoted by the three monkeys of महात्मा गांधी, rather four. One can appreciate that meaning of इन्द्रियार्थेभ्यः इन्द्रियाणि सर्वशः संहरते is very subtle and deep and to put it in practice or to acquire such capability is so very challenging. (3) There are some interesting undertones even in the grammar in the श्लोक. Although I gave in the beginning the अन्वय as three clauses, the relational conjunctions make an interesting study. (3-1) The main clause is तस्य प्रज्ञा प्रतिष्ठिता. There is no verb here. Usually one would take अस्ति or भवति as the implicit verb. I would rather take उच्यते to be the implicit verb. Literal meaning of this verb उच्यते is “is called as”. So the main clause becomes तस्य प्रज्ञा प्रतिष्ठिता उच्यते. तस्य his प्रज्ञा intellect उच्यते is called as प्रतिष्ठिता. (3-1-1) I have not interpreted the word प्रतिष्ठिता, because it merits some deliberation. The word is used in most Indian languages in such contexts as – He is a प्रतिष्ठित member in the society. In such context प्रतिष्ठित means ‘one with status’ or ‘elite’. In the same vein, प्रतिष्ठिता प्रज्ञा can be interpreted as ‘elite intellect’ or an intellect with a status. An elitist status is a status on a high pedestal, honorable. Certainly such प्रज्ञा, as specified in the sub-clause(s), would be regarded as प्रतिष्ठिता highly respectable. (3-1-2) Grammatically प्रतिष्ठिता is feminine adjective in past tense and with passive voice inbuilt, derived from प्रति + स्था. The prefix प्रति seems to bring the meaning of ‘elitist status’. By that, meaning of प्रतिष्ठिता can be taken as ‘taken to an elitist status’. Rather this word प्रतिष्ठिता suggests one meaning of the prefix प्रति to be ‘at or unto an elevated or elite status’. (3-2) The sub-clause कूर्मः अङ्गानि संहरते इव has the relational conjunction इव which is combination of the English pair ‘so … as’ or Sanskrit pair यथा … तथा. (3-3) The other subclause यदा अयम् इन्द्रियार्थेभ्यः इन्द्रियाणि सर्वशः संहरते has the relational conjunction यदा. Usually it pairs with तदा. Although the pair यदा-तदा has time domain for the relation of ‘when … then’, in Sanskrit, its usage for the relation ‘if-then’ is not uncommon. (3-3-1) Although there is no तदा explicit here, one should take it as implicit in यदा. (3-4) Between अयम् in यदा अयं संहरते and तस्य in तस्य प्रज्ञा प्रतिष्ठिता, there is also an adjectival relationship. So the subclause यदा अयं संहरते has dual relationship with the main clause तस्य प्रज्ञा प्रतिष्ठिता. (3-4-1) One is adjectival relationship between अयम् and तस्य. (3-4-2) Another is adverbial relationship by virtue of यदा. This adverbial relationship is both of time-domain and of condition-domain, which is also so, in the computer-programming construct of ‘if-then’. (4) The word अयम् is masculine first case singular of the pronoun इदम्, which means someone nearby. This श्लोक is by श्रीकृष्णभगवान्. In using the word अयम्, He is referring to someone nearby to Him and hence someone dear to Him. But in the main clause, the corresponding word is तस्य, (masculine), sixth case singular of the pronoun तत्, which signals ‘he’. Does this suggest that one, whose प्रज्ञा is प्रतिष्ठिता, becomes He ? Is this some suggestion of the महावाक्य Great Quote तत्त्वमसि ? Is this the reason why the second line has all such great import, that it is repeated verbatim in 2-68 ? (5) One should not miss the significance of the word सर्वशः. Retraction should apply to all इन्द्रिय-s, without exception. The sense of स्पर्श touch is इन्द्रियार्थ of इन्द्रिय त्वच् the skin. This also is to be retracted !! (5-1) Bio-sketch of कर्ण makes an interesting study in the context of retraction of the sense of स्पर्श touch, the इन्द्रियार्थ of इन्द्रिय त्वच् the skin. (5-1-1) कर्ण was born with a special skin, which was his great defense also. But having given his word, he did not hesitate to donate that skin and make himself devoid of his defense. (5-1-2) He was comforting his गुरु परशुराम, from whom he acquired पाशुपतास्र. When he was doing his service, a bee not only stung him on his lap, but even started extracting his blood. कर्ण unflinchingly continued his service. Is this not an example of making oneself unmindful of what was happening to the skin, rather so retracting the skin that one is devoid of the sense of touch ? The entire epic महाभारतम् is great, because biosketches of different characters bring forth and evidence very challenging concepts such as इन्द्रियाणि इन्द्रियार्थेभ्यः सर्वशः संहरते !! !